State leaders are at the forefront of creating innovative early childhood care and learning systems around the country. The Child Care State Capacity Building Center (SCBC), one of the Office of Child Care’s Technical Assistance (TA) Centers within the U.S. Department of Health and Human Services (HHS), frequently releases resources that provide state leaders with early childhood technical assistance support. Specifically, the SCBC Infant/Toddler Specialist Network resources help support policies and practices to increase the supply of high-quality infant and toddler child care. 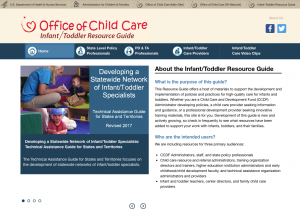 This month, the SCBC, hosted a webinar on how to best utilize their Infant and Toddler Resource Guide to support administrator and technical assistance work. Professionals within each audience can find appropriate resources and materials for their line of work. Research shows us that when young children experience quality early care and learning they have better education, health, social and economic outcomes in life – increasing their productivity and reducing the need for spending later on. The SCBC’s resources once again play a critical role in helping state leaders enhance and implement high-quality early care and learning for our nation’s youngest learners. To access the Infant and Toddler Resource guide, click here. To view the webinar of how best to utilize the guide, click here.